Scenario: You are contacted by a restaurant chain who are interested in marketing advice and advertising. This is an opportunity for you to obtain another project for your company, and as such we will first create an Opportunity for this potential client. Before you go ahead and create the opportunity, what you will need to do first, for the purposes of this tutorial, is go in and edit a few Opportunity Settings. We will be editing Opportunity Types, Stages, and Probabilities. Opportunity TYPES are simply used to define the kind of Opportunity that is opening. In this case, we are creating a Marketing opportunity and will therefore create a ‘Marketing’ opportunity type. STAGES are used to define the level of progress being made in an opportunity. 1. From the side navigation click on CRM and then on SETTINGS. 2. Click on OPPORTUNITY from the lower half of the screen. Now you can begin editing your opportunity settings. 3. Underneath the Opportunity Types settings, type in ‘Small Business’ in the text field and click ADD TYPE. This will allow us to select Small Business for the Opportunity Type when we create the opportunity in the next step. 4. Let’s now create 3 different Stages. As the opportunity develops and we progress with the potential client, we can update the Opportunity Stage. Type in ’10 Initial Contact’ in the Opportunity Stages text field and click ADD STAGE. Repeat, adding ’50 Evaluation Progress’ and ‘Agreement Finalised’. The numbers 10 and 50 will allow you to keep the Stages in the correct order, as Stages in Kazeli are sorted numerically and then alphabetically. 5. Now you will enter in just a couple of Opporunity probabilities befor you leave the settings area. 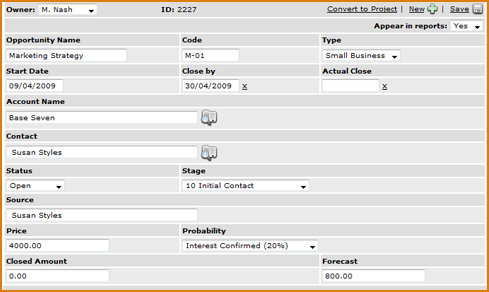 In the Opportunity Probabilities space, type in Interest Confirmed and select 20% from the dropdown list, then click ADD PROBABILITY. Next, type in PASSED EVALUATION and click ADD PROBABILITY. We can now begin creating our first Opportunity. 1. From the side navigation click on CRM and then on OPPORTUNITIES. 2. Click on ADD OPPORTUNITY (top right). 3. Fill out the fields up until the point shown in the screenshot below. To set the dates, simply click inside the fields to bring up the pop-up calendar. Click inside these fields to select from your contacts database. Your advetising agency will be plannig and executing a Marketing strategy for the company. As such, we have given the Opportunity name ‘Marketing Strategy’. We also give the code of M-01 – ‘M’ to define that this is a Marketing and 01 to define this as our first Marketing opportunity. Your company has chosen to define Opportunity Types by the size of business you are dealing with. We will choose Small Business as the type. We can set the start date 09/04/2009 and we want it closed by the 30th. The Actual Close date is the date at which we actually win the opportunty. You can leave his empty for now. We are creating this opportunity for Base Seven. This opportunity is still ‘open’ – so it is still in contention to be won. We have had only initial contact with Base Seven and are still putting forward our proposals. Who was the initial contact which led us to this opportunity? How much are you asking for the project? The chances we gve ourselves of closing the opportunity, depending on what stage discussions / proposals are at. We have confirmed interst in our services, as are giving ourselves a 20% chance at this early stage of closing the opportunity. The forecast is entered in automatically and i calulated by multiplying the prie by the probability. So 20% x 4000 gives us 800. This is how much the opportunity is ‘woth’ at the moment. The forecast field is useful for prioritising your opportunties to help you focus your organization’s attention on the opporunitis that matter most.